Swindon Town first-team coach Ross Embleton has said the League One side will continue to play attacking football following Saturday's 4-2 comeback victory over Southend. The Robins were 2-0 behind after just 13 minutes before the turnaround. "We play a style of football that sometimes is about taking risks," Embleton told BBC Wiltshire. "Outside one or two rocky moments the actual performance was still quite good during the first 15 minutes." Since the 33-year-old became first-team coach in November, the Robins have scored 17 goals in nine matches compared to the 23 they managed in the 20 games before his appointment. Swindon, who are being led by temporary boss Luke Williams following Martin Ling's resignation last month, face Port Vale in the next league match. Although Vale have only conceded six goals in their last eight home matches, Embleton says the team are confident of scoring. "We believe we can score in every game against any defence and we have to remember the amount of goals we have scored since I took charge," he said. "As a group we are very realistic and we try not to get too carried away with a win or a loss. "We were over the moon, it was a very good moment for all of us after the game but boys are now preparing for the next game." 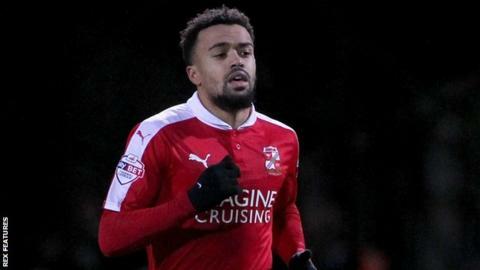 After five loan players returned to their parent clubs last week, Embleton gave some hope of seeing one of those, Norwich City midfielder Louis Thompson, play for Swindon again this season. "He is a fantastic player and someone the supporters and us as a group of staff would love to see return," the former Tottenham and Bournemouth coach said. "I think the priority for Louis is to get himself fit and well again, ready to train and play football. Then that decision (for Thompson to return) can be made by us as a club and by Norwich."